My very favorite time of year is coming up. Advent!! Since childhood, I have loved this time of year! Now that I'm a Mom, I'm able to share my excitement with my own family. I've shared how I try to prepare for the Nativity fast, and I want to share some of the activities we do on a nightly basis with the kids. Tree - the night before Advent ( a Friday this year!) my husband and I put our Christmas tree up after the kids go to bed. (Yes, we have an artificial tree.) We don't decorate it, just put it up with the lights. The next morning the kids wake up and see the big tree all lit up, and they know what day it is! That day, (or night if it's a week day) we decorate the tree and the rest of the house. At the suggestion of a friend we're going to wait to put up our stockings until the night before St. Nicholas Day. Calendar - You can find a paper calendar with 40 doors at many websites, but I have made my own permanent calendar. It has been wonderful to use this every year! If you haven't seen one, here are the instructions If you need any more help I'd be happy to send you pictures of mine. Every night we light our candles. We have 6 this year (since Advent starts on a Saturday). I personally use all purple candles, except for the one used during the week of the Presentation of the Theotokos. That week I use a blue candle. My parish provides readings for each night, so we also use those. Again, I'd be happy to share. Nativity Scene - This is a tradition that my parents started, and it really helps my kids understand the journey to Christ's birth. We set up our Nativity scene and place the shepherd and animals in the cave. 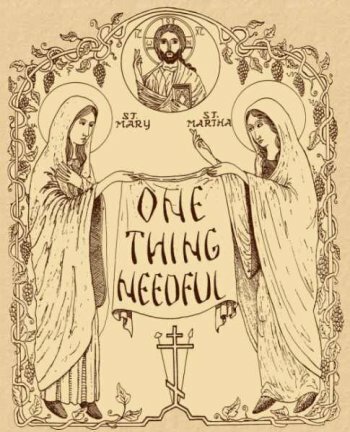 We place the Theotokos and St. Joseph far away from the cave ( we have ours on a long counter. I cut out 39 "stones" out of brown construction paper. These lead up to the cave. Each night one of the kids move Mary and Joseph up one step towards the Nativity scene. On Christmas Eve, before our service, we place Mary and Joseph in the cave. After the kids go to the car for church I sneak baby Jesus into the cave (He stays hidden during Advent) and when we get home, He is in the cave! We add the Wise Men at Theophany. Christmas Books - I keep my Christmas books put away during the year, and during our evening Advent time I let one of the kids "unwrap" a book to read. I keep these books wrapped under the tree. Once they've opened a book, it's added to our book basket and they can continue to look at it throughout Advent. Last year, at the suggestion of a friend, I purchased the Playm*bil Nativity Set. My older two loved playing with this set! This year, I'm going to have to be a little more careful with it since my 18 month old could easily pop any of the pieces into her mouth! So, as you can see, Advent is a very special time for our family! Needless to say, I am so excited that we only have a week and a half before it all begins! Wow. So many wonderful ideas. The last few Christmases in our house have been stressful and unhappy times due to illness and family troubles, so we haven't really developed any family traditions for the season. 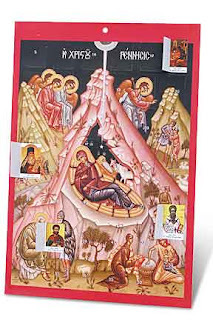 You've given me some great ideas on how to incorporate my Orthodoxy into Christmastime. I have many traditions from my family as I was growing up, but we weren't practicing Orthodox Christians, nor were we attending church at all. I just found you when you commented on Anne Marie's blog. Lots of great Advent ideas here. We do the same thing with the stones and the walk to the cave, which is my repetition of what we did growing up. (Think our moms learned it the same place? :)) I posted a photo last year on my fasting blog and I'll post it again this year. But I love the idea of wrapping the Christmas books and then unwrapping them during Advent. We don't put up our tree until St. Herman Day (Dec. 13), but we could still do the wrapping and unwrapping. Thanks for the idea! I've enjoyed visiting your blog today! I came over from the Festal Celebrations Gallery. Thanks for sharing your ideas!